Ball-milled biochars (BM-biochars) were produced through ball milling of pristine biochars derived from different biomass at three pyrolysis temperatures (300, 450, and 600 °C). The results of scanning electron microscopic (SEM), surface area, hydrodynamic diameter test, and Fourier transform infrared spectroscopy (FTIR) revealed that BM-biochars had smaller particle size (140–250 nm compared to 0.5–1 mm for unmilled biochar), greater stability, and more oxygen-containing functional groups (2.2–4.4 mmol/g compared to 0.8–2.9 for unmilled biochar) than the pristine biochars. 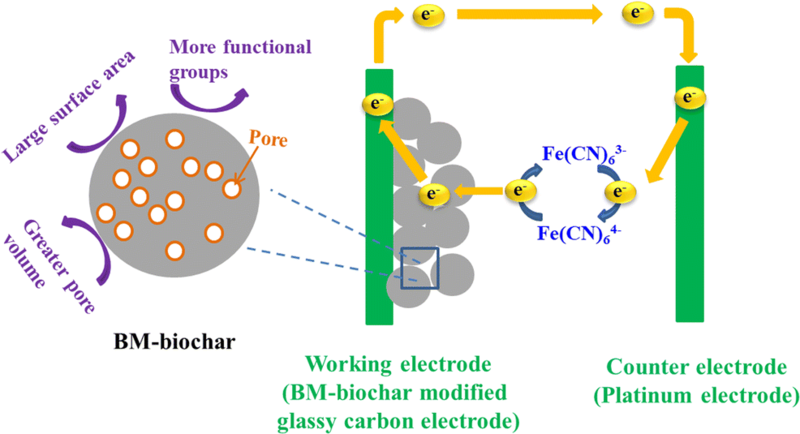 With these changes, all the BM-biochar-modified glassy carbon electrodes (BM-biochar/GCEs) exhibited prominent electrochemical properties (e.g., ΔEp of 119–254 mV compared to 850 mV for bare GCE). Cyclic voltammetry (CV) and electrochemical impedance spectra (EIS) show that ball-milled 600 °C biochar/GCE (BMBB600/GCE and BMBG600/GCE) had the smallest peak-to-peak separation (ΔEp = 119 and 132 mV, respectively), series resistance (RS = 88.7 and 89.5 Ω, respectively), and charge transfer resistance (RCT = 1224 and 1382 Ω, respectively), implying its best electrocatalytic activity for the reduction of Fe(CN)63−. It is supposed that the special structure (i.e., internal surface area, pore volume, oxygen-containing functional groups, and graphitic structure) facilitates the electron transfer and reduces interface resistance. Economic cost of BM-biochar/GCE was 1.97 × 10−7 USD/cm2, much lower than that of a “low-cost platinum electrode” (0.03 USD/cm2). 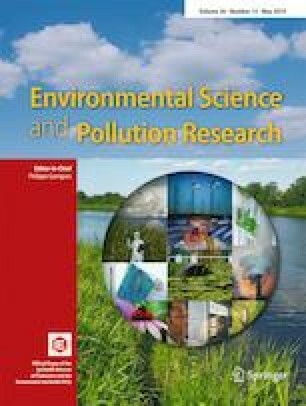 The results indicate potential application of the novel BM-biochar for low cost and high efficient electrodes. The online version of this article ( https://doi.org/10.1007/s11356-019-04899-4) contains supplementary material, which is available to authorized users. This work was partially supported by the Key Laboratory of Original Agro-Environmental Pollution Prevention and Control, Ministry of Agriculture/Tianjin Key Laboratory of Agro-environment and Safe-product [18nybcdhj-5 and 18nybcdhj-1], the National Natural Science Foundation of China (41807363), Guangxi Natural Science Foundation (Nos.AD17195058), the Key Research and Development Project of the Ministry of Science and Technology (2018YFB0605101), and the Key Project Natural Science Foundation of Tianjin (18JCZDJC39800).